Ramblings on bookish matters. Horror and fantasy have the lion’s share, but not exclusively. Occasional interviews, art posts and bumblings. I was thrilled by the concept behind the “Terror Tales” series of anthologies edited by Paul Finch and published by Gray Friar Press from the first volume released and six collections later I still cannot suppress my delight with all these books traveling across England’s provinces to highlight local legends and myths and dress them in new clothes. I also stated several times my dream of seeing such anthologies journeying across the globe in order to explore the rich vein of world’s folklore and myths and to shine a light on more such stories. You can imagine my joy when I discovered a new collection of short stories following my line of thought. “European Monsters” is one answer to my dream, an anthology dedicated to the frightening creatures at the heart of local folklore, myths and legends. And it gets even better, “European Monsters” is just the first of a new series of anthologies with this concept at its base, Fox Spirit Books, the publisher of this collection, announces that the next volumes have already booked tickets to further destinations, with the first of them being Africa in 2015. It is almost as much as I hoped for. I say almost because there is nothing to go by from here, I mean the concept is very clear and I have no complains about it. As a matter of fact, I have no complains what so ever about what keeps my delight in check either, but it still needs to be said, the table of contents assembled by the editors Jo Thomas and Margrét Helgadóttir features only a couple of familiar names. Nothing worrisome, on the contrary, as much as “European Monsters” is similar to the chance of discovering legends and myths unfamiliar to me so far, it is also an opportunity for finding new writers. It will certainly not be the first time when such a things happen, but until I read the collection I have no possibility to opinion on the matter. 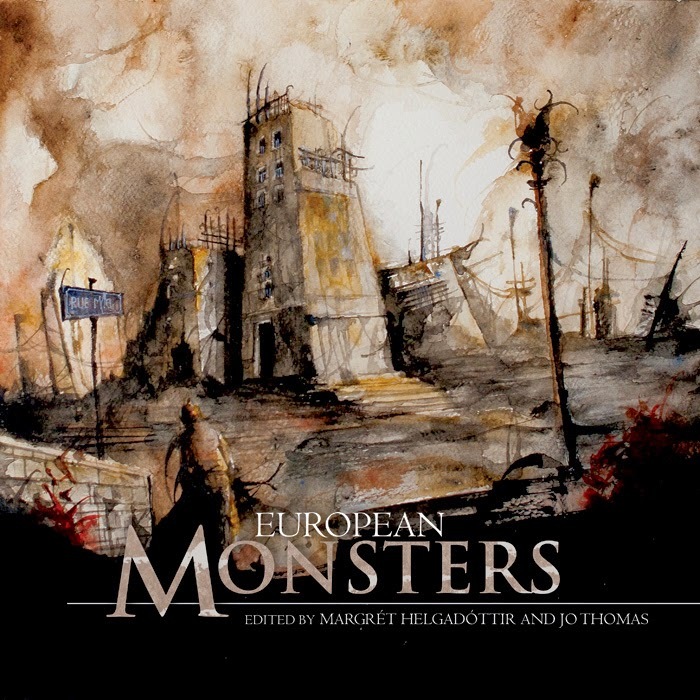 Another interesting fact regarding “European Monsters” edited by Jo Thomas and Margrét Helgadóttir is that we are talking about a coffee table book and this is one of my first experiences with such volumes. I’ve seen a couple, I don’t own any and yet, I am more than willing to put “European Monsters” on my coffee table. After all, I cannot say that monsters aren’t among the most interesting guests to have for a cup of coffee. They lurk and crawl and fly in the shadows of our mind. We know them from ancient legends and tales whispered by the campfire. They hide under the dark bridge, in the deep woods or out on the great plains, in the drizzling rain forest or out on the foggy moor, beneath the surface, under your bed. They don’t sparkle or have any interest in us except to tear us apart. They are the monsters! Forgotten, unknown, misunderstood, overused, watered down. We adore them still. We want to give them a renaissance, to reestablish their dark reputation, to give them a comeback, let the world know of their real terror. Welcome to ‘The Fox Spirit Books of Monsters’. A book series with dark fiction and art about monsters from around the world, starting with Europe, continuing with Africa in 2015 before the travel continues. Fox Spirit Books will take you from continent to continent, bringing you art and dark fiction about monsters based on local folklore, myths and legends from around the world. © 2015 Mihai Adăscăliţei. With the exception of images or otherwise stated.